Merry Christmas! Today we discuss how the satellites of Uranus were formed. It is usually thought the satellites of a giant planets formed from a protoplanetary nebula. Originally there was a cloud of gas and dust, mass accumulated in the center to form the planet, and protosatellites were created from the accretion of mass as well. This was well understood for the gas giants like Jupiter, but Uranus is much smaller (23 times lighter). The Swiss study I present today, In situ formation of icy moons of Uranus and Neptune, by Judit Szulágyi, Marco Cilibrasi and Lucio Mayer, solves this problem. This study has recently been published in The Astrophysical Journal Letters. and the irregular moons, which orbit very far from the planet, and on significantly eccentric and inclined orbits. These bodies are probably former asteroids, which were trapped by the gravitational field of Uranus. As I said, we are interested in the main 5 satellites, which are listed below. Their semimajor axes are given with respect to the mean equatorial radius of Uranus, which is 25,559 km. and two even larger ones, Titania and Oberon, which orbit even further from the planet. Titania and Oberon have been discovered in 1787 by the German-British astronomer William Herschel, only 6 years after the same William Herschel discovered Uranus. Actually, Uranus was (and still is) visible to the naked eye, and had been observed many times before. But how to know it was a planet, and not a star? Well, a star does not move in the sky (actually, it does a very little…), while a planet moves. But since Uranus orbits very far from the Sun, its motion is pretty slow. Herschel detected such motion, but he thought at that time that Uranus was a comet. The computation of its motion showed a pretty circular orbit, proving it was a planet. After that, Uranus has been observed many times, and Herschel noticed two dots following Uranus. Since they followed Uranus, it meant they were gravitationally bound to it, hence satellites. These two dots were the two largest of them, i.e. Titania and Oberon. Seventy years after the discovery of Uranus, the British merchant and astronomer William Lassell, who by the way made his fortune as a beer brewer, built his own telescope. He polished himself the mirror, and pioneered the use of the equatorial mount, which facilitated the tracking of objects with respect to the rotation of the Earth. His telescope permitted him to discover the satellite of Neptune Triton, to co-discover the satellite of Saturn Hyperion, and to discover the satellites of Uranus Ariel and Umbriel. For Miranda, we had to wait for the Dutch-American astronomer Gerard (Gerrit) Peter (Pieter) Kuiper. He discovered Miranda in 1948 and the satellite of Neptune Nereid in 1949, at McDonald Observatory (TX, USA). Kuiper is mostly known for having proposed the existence of the so-called Kuiper Belt, i.e. a belt of asteroids orbiting beyond the orbit of Neptune. He has also been the thesis advisor of Carl Sagan. Let us go back to the table, and have a look at their properties. We can see that these bodies have small eccentricities and inclinations, i.e. they orbit in the equatorial plane of Uranus, on pretty circular orbits. There is anyway an exception to this rule, which is the significant inclination of Miranda (4.2°). This inclination has probably been excited by a past 3:1 mean motion resonance with Umbriel. Another interesting point is the density of these bodies. 1g/cm3 means a composition close to water. Pure water ice would be a little less dense. Here we have densities between 1 and 2, which means that these bodies are mixtures of ice and silicates. This property they share is a clue, which suggests a common formation process. Let us investigate the formation from the protoplanetary disk. Let us figure out how a giant planet is formed. First you have a protoplanetary nebula, made of gas and dust. Matter accumulates and aggregates at its center, creating a star (if the nebula is massive enough). To compensate this accumulation at the center (conservation of the total angular momentum), the matter which is still outside the star accelerates, and the nebula becomes a disk, which orbits the star. Then (may be a little meanwhile, actually), you have local accretions of matter, which create the planets. And sometimes, if you have enough matter, then you have a circumplanetary disk around some of the planets, in which matter aggregates… and creates the satellites! Well, this way, it seems to be easy. One question is: how massive need the protoplanetary disk to be, to create the satellites. It was known that it works for Jupiter. This study wonders whether it works for Uranus. To answer this question, the authors ran intensive numerical simulations, using the hydrocode JUPITER. By hydrocode I mean that it simulates a hydrodynamic system. Actually, a disk is made of particles of gas and dust. It is highly challenging, even if it is sometimes tried, to consider all the particles constituting it, and model their motion and their interactions. Instead, you can consider that the whole disk acts as a gas, and model the collisions between the particles as a viscosity. Simulating this motion requires to split the disk into cells, use the method of finite elements, i.e. the state of a given part of the disk depends on the state of its neighbors… This requires intensive computing facilities. In JUPITER, you can focus on a given region, for instance where a planet is created. the initial temperature of the central planet. It appeared that this temperature, set to 1000K, 500K and 100K, plays a critical role in the possibility to create the satellites. Consider this effect is possible in JUPITER since 2016 and the implementation of a module, which models the radiative transfer in the disk. As a consequence, it models the effects of the heating and cooling of the gas. The simulations show that the circumplanetary gaseous disk was formed when the temperature dropped below 500K (227°C, or 441°F). In that case, icy moons were formed in most of the simulations, which strongly suggests that the present satellites of Uranus were formed that way. Neptune is somehow like Uranus, by its size. This is why the authors ran similar simulations, which showed similar results, i.e. formation of icy, mid-sized satellites. But wait, this is not what we see. When we observe the system of Neptune, we see a large satellite, Triton, which is highly inclined, on a retrograde orbit. As we discussed here, Triton behaved like a cuckoo. 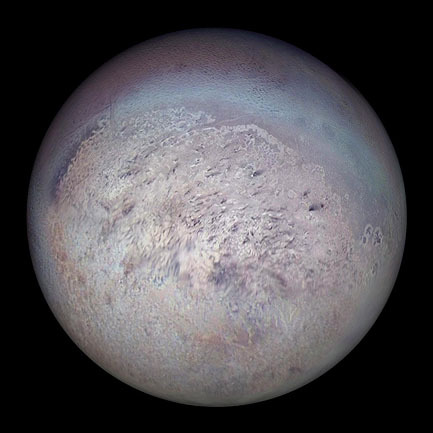 Triton was an asteroid, which has been trapped in the gravity field of Neptune. Then it was so massive than it ejected the satellites, which were present… if they existed. What this study tells us is that they probably existed. Nereid was probably one of them. Where are the others now? In my opinion, they could be almost anywhere, since the Solar System is a mess. and the webpage of Lucio Mayer. Hi there! Can you imagine that our water does not originally come from the Earth, but from the outer Solar System? The study I present you today explains us how it came to us. This is Origin of water in the inner Solar System: Planetesimals scattered inward during Jupiter and Saturn’s rapid gas accretion by Sean Raymond and Andre Izidoro, which has recently been published in Icarus. No water below this line! There are several competing scenarios, which describe a possible path followed by the Solar System from its early state to its current one. But all agree that there was originally a protoplanetary disk, orbiting our Sun. It was constituted of small particles and gas. Some of the small particles accreted to form the giant planets, first as a massive core, then in accreting some gas around. The proto-Jupiter cleared a ring-shaped gap around its orbit in the disk, Saturn formed as well, the planets migrated, in interacting with the gas. How fast did they migrate? Inward? Outward? Both? Scenarios diverge. Anyway, the gas was eventually ejected, and the protoplanetary disk was essentially cleared, except when it is not. There remains the telluric planets, the giant planets, and the asteroids, many of them constituting the Main Belt, which lies between the orbits of Mars and Jupiter. If you want to elaborate a fully consistent scenario of formation / evolution of the Solar System, you should match the observations as much as possible. This means matching the orbits of the existing objects, but not only. If you can match their chemistry as well, that is better. The origin of water is a mystery. You know that we have water on Earth. It seems that this water comes from the so-called C-type asteroids. 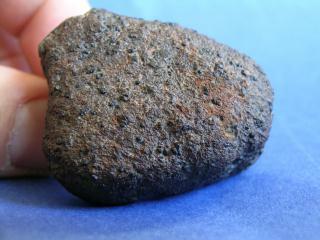 These are carbonaceous asteroids, which contain a significant proportion of water, usually between 5 and 20%. This is somehow the same water as on Earth. In particular, it is consistent with the ratios D/H and 15N/14N present in our water. D is the deuterium, it is an isotope of hydrogen (H), while 15N and 14N are two isotopes of nitrogen (N). But there is one: the location of the snow line changes during the formation of the Solar System, since it depends on the dynamical structure of the disk, i.e. eccentricity of the particles constituting it, turbulence in the gas, etc. in addition to the evolution of the central star, of course. To be honest with you, I have gone through some literature and I cannot tell you where the snow line was at a given date, it seems to me that this is still an open question. But the authors of this study, who are world experts of the question, say that the snow line was further than that when these C-types asteroids formed. I trust them. And this raises an issue: the C-types asteroids, composed of at least 5% of water, have formed further than they are. This study explains us how they migrated inward, from their original location to their present one. the evolution scenario of the early Solar System. In particular, the way the giant planets migrated. Simulating the formation of the planet actually affects the orbital evolution of the planetesimals, since the mass of the planets is increasing. The more massive the planet, the most deviated the asteroid. And the authors succeed in putting C-type asteroids with this mechanism: when a planetesimal encounters a proto-planet (usually the proto-Jupiter), its eccentricity reaches high numbers, which threatens its orbital stability around the Sun. But the gas drag damps this eccentricity. So, these two effects compete, and when ideally balanced this results in asteroids in the Main-Belt, on low eccentric orbits. And the authors show that this works best for mid-sized asteroids, i.e. of the order of a few hundreds of km. Below, Jupiter ejects them very fast. Beyond, the gas drag is not efficient enough to damp the eccentricity. And this is consistent with the current observations, i.e. there is only one C-type asteroid larger than 1,000 km, this is the well-known Ceres. However, the scenarios of evolution of the Solar System do not significantly affect this mechanism. So, it does not tell us how the giant planets migrated. Once the water ice has reached the main asteroid belt, other mechanism (meteorites) carry it to the Earth, where it can survive thanks to our atmosphere. This study proposes a mechanism of water delivery, which could be adapted to any planetary system. In particular, it tells us a way to make exoplanetary planets habitable. Probably more to come in the future. The IAU page of Andre Izidoro. And I would like to mention Pixabay, which provides free images, in particular the one of Cape Canaveral you see today. Is this shuttle going to fetch some water somewhere?